First up into Klagenfurt to get the tyres and brakes seen to and things worked out near perfect. Lothar got rid of his slicks just in time for the run through Sankt Veit an der Glan and onto the Gurk Valley road. Next Kraig and Pisweg , then Gurk... turning right to Zwischenwässern. From Althofen onto the Klippitztörl-Passstraße (1644m), another beautiful bike-road. At Wiesenau it was a right turn across the Twimberg and towards the Packsattel (1169m). Passing through Köchlach and Voitsberg along the backroads to Geistthal and Großstübing we reached the Mur Valley at Kleinstübing, following the idyllic Mur Valley to Bruck an der Mur, which was the eastern-most point of our ride. Turning west, through to Leoben for a right turn to Eisenerz. Just past the saddle of the Präbichl (1227m) is the Erzberg , a gigantic open-cut mine, which also gets used for the annual MX-races. It sure is a tourist-attraction but it also glaringly shows the damage to nature that commerce creates. It turned out, that due to some earthworks her business was badly affected and the local Shire was prepared to compensate her accordingly...resulting in free accomodation for us if we’d only sign into her book. A major run west today, but not without dipping into another scenic highlight: The Salzkammergut area. Following the B 115 to Hieflau, we turned left onto the B 146 Through Gesäuse and Admont, Liezen, Steinach and Bad Mittendorf to Bad Aussee. 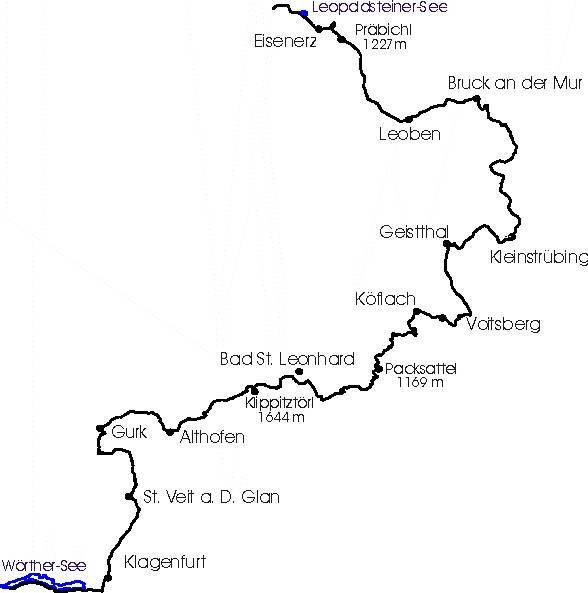 Then across the Koppenpass (630 m) towards Lake Hallstätter and with a short stop along its shores, to Hallstadt, Bad Goisern, Bad Ischl to the Traunsee. Leaving the shores at Mitterndorf it’s via Neukirchen to Steinbach at the Attersee, a Gasthof on the shore provided a nice lunch stop. 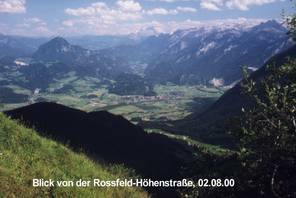 We continued to Unterach at the Mondsee, looping the lake to Gilgen as the direct route was closed, Last lake on the route was the Wolfgang-See, turning in Strobl onto a tiny toll- road to the Post-Alm, a beautiful, but narrow stretch in very scenic surrounds....the views across to the Dachstein are breathtaking. Via Golling to Hallein and onto the B 160 back into Germany. The Roßfeld-Höhenstraße was next on the „Program of Dream Roads“ , the toll being worth every cent. Views into the valleys are stunning either way... Austrian or german direction. Through Berchtesgaden on the B 305 across the Schwarzbachwachtsattel (868 m) towards Inzell for our final camp site just south of Ruhpolding. Very recommendable, too...clean, very much looked-after and very reasonable at 12DM/ head. Back via Reit im Winkel into Österreich and Kössen along the Walchsees to Niederndorf....just as it started to rain again, time for the wet-gear once more. Dietmar split for a straight run home to Munich as we were turning left towards Kufstein...and promptly the rain stopped. 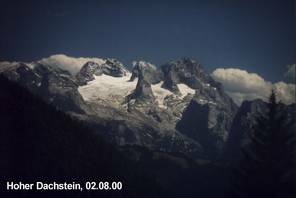 First Kufstein, then St. Johann and Kitzbühel, across Pass Thurn (1274m) and into Mittersil. For our last lunch-stop. After the break it was across the Gerlospass (1507m) into the Zillertal (Ziller Valley), where a roadworks-section with lights had us confused...as the lights turned green, so did the the lights for the opposing traffic and weren’t we glad to be on bikes, things got a bit squeezy. In Zell am Ziller it was a left turn to get onto the Zillertaler-Höhenstraße, pity that it started to rain around the top and views were non-exist. After a short break in one of the Cafes we continued on, as the rain kept coming down right up the the front door at Sonthofen. Past the Achensee and across the Achenpass (941m) , then along the shortes of the Sylvensteinspeicher. Vorderriß and Garmisch-Partenkirchen were next. Erwald and Reutte followed, let’s not forget the Gaicht-Pass (1082m) and Oberjoch-Pass (1180m) along the way....back to a wet Sonthofen. All up it was 5800km in 17 days, averaging about 340/ day. 92 passes of all sorts and calibers, endless hairpins and a load of fun. The weather-gods meant well with us, wetgear was need on only 3 occasions, and most of those fairly short, while the folks at home copped a lot more of the wet stuff during the same time. We followed nearly all of the route detailed in the book mentioned above...and it’s a absolute hoot! Despite my knack for finding good bike-roads over the years...I couldn’t have picked any better. 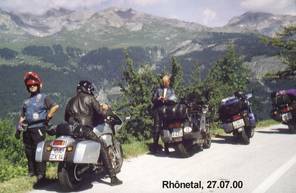 Werner’s complaints about the „ too many stops“ were a regular thing....but with scenery like that (and a smoker, Lothar, in the group), stops are really a „must“. I rather like riding much and often myself, but breaks are essential... otherwise there’s no use in visiting an area like the Alps. In the left window of google-earth each day is listed. You can enable or disable individually. So you can look at every single day just once more!